Influenza viruses cause annual epidemics and occasional pandemics of acute respiratory disease. Vaccination is the primary means to prevent and control the disease. However, influenza viruses undergo continual antigenic variation, which requires the annual reformulation of trivalent influenza vaccines, making influenza unique among pathogens for which vaccines have been developed. The segmented nature of the influenza virus genome allows for the traditional reassortment between two viruses in a coinfected cell. This technique has long been used to generate strains for the preparation of either inactivated or live attenuated influenza vaccines. 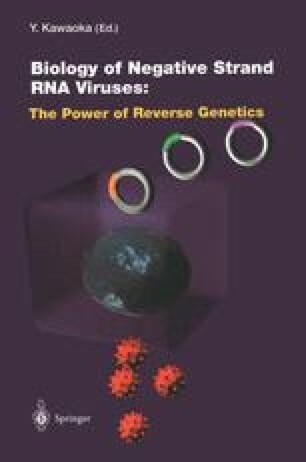 Recent advancements in reverse genetics techniques now make it possible to generate influenza viruses entirely from cloned plasmid DNA by cotransfection of appropriate cells with 8 or 12 plasmids encoding the influenza virion sense RNA and/or mRNA. Once regulatory issues have been addressed, this technology will enable the routine and rapid generation of strains for either inactivated or live attenuated influenza vaccine. In addition, the technology offers the potential for new vaccine strategies based on the generation of genetically engineered donors attenuated through directed mutation of one or more internal genes. Reverse genetics techniques are also proving to be important for the development of pandemic influenza vaccines, because the technology provides a means to modify genes to remove virulence determinants found in highly pathogenic avian strains. The future of influenza prevention and control lies in the application of this powerful technology for the generation of safe and more effective influenza vaccines.